This mis en place turned out rather pretty. 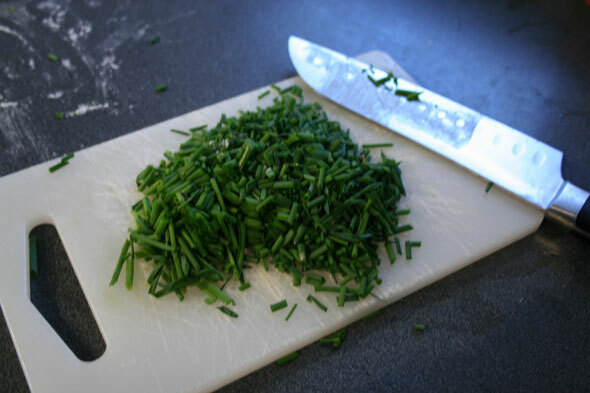 The players in this production are: Bread flour, 1 ounce or 28.3g of fresh chives, which turns out to be a fair bit, our perky starter, boiled and unpeeled potatoes & potato water, both cooled, about 120g of sliced cheddar, salt and yeast. So although it does have sourdough starter, the bread still calls for instant yeast which is how we can do this bread in just one day. 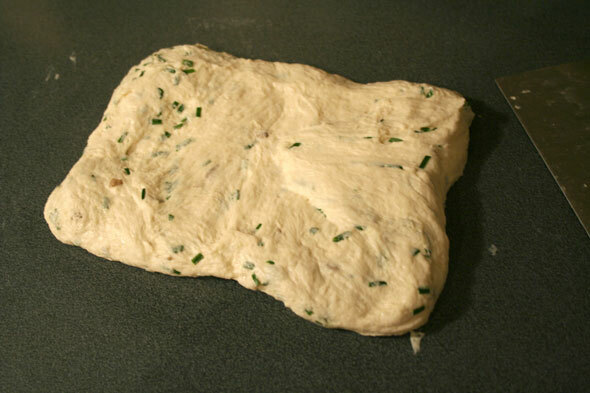 We’ll cover the cheese and put the chives aside for the next hour or so as we need to prepare the dough first. 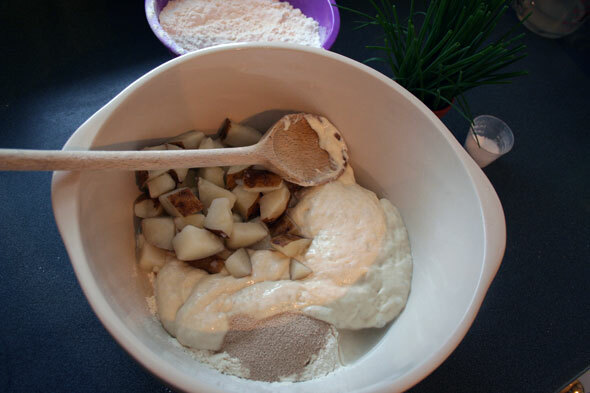 We mix half the flour (roughly), the starter, potatoes, yeast and about 1/2c of potato water and mix until the dough forms a ball. Although the book does say to “use a large spoon” (I opted to not use the mixer today), I found it was pretty pointless and just went in with my hands after a minute of spoon mixing. Hands and the plastic scraper were much better for this job. We work the ball of dough a little until it’s well mixed, no pockets of dry flour are left at the bottom and the potato bits start to be incorporated. Reinhart then says to leave the dough uncovered for 30 minutes without any further explanation but this does give the dough a little autolyse time. After 30 minutes rest, the remaining flour is added along with the salt and we can add “as much as you need of the remaining water”. I ended up using 3/4 cups in total. Although throughout the Challenge I found my flour to absorb more water than the BBA recipes have called for, this time I seemed to have used less than the full cup available. 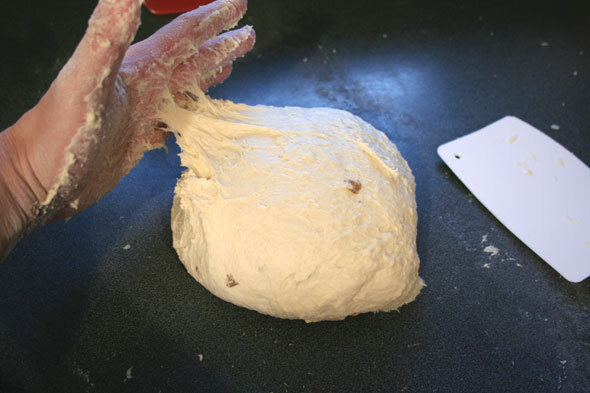 The dough is quite soft and sticky. Perhaps the addition of the boiled potato added a fair bit of moisture. 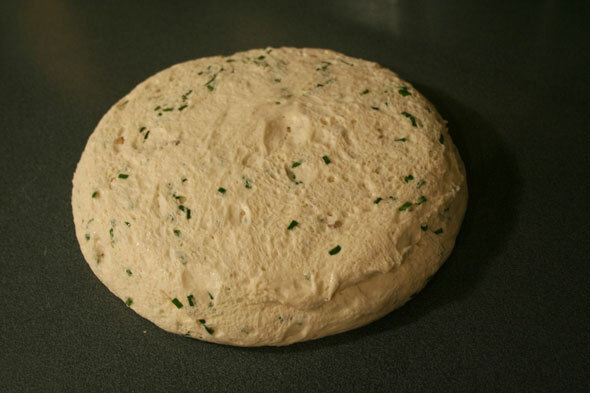 The dough ball is then turned out onto the counter and kneaded for about 6 minutes. 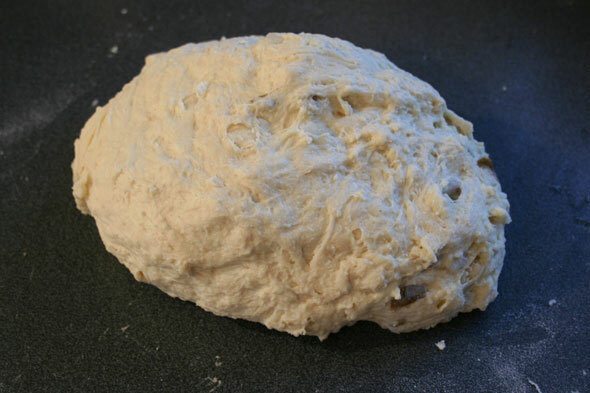 Even after that kneading, the dough is still quite tacky. 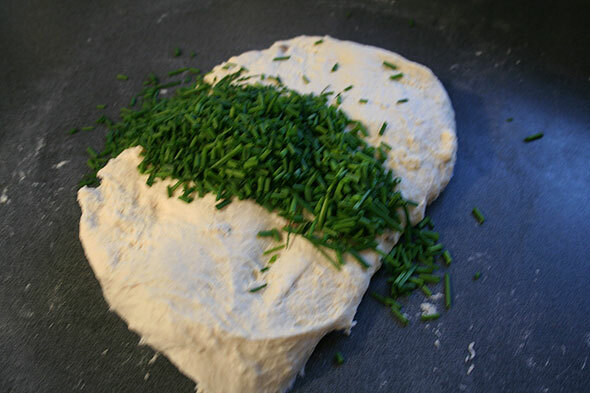 I then chopped up the chives – it was really a substantial amount and made the kitchen smell great – then keaded it into the dough for another 2 minutes or so until evenly distributed. 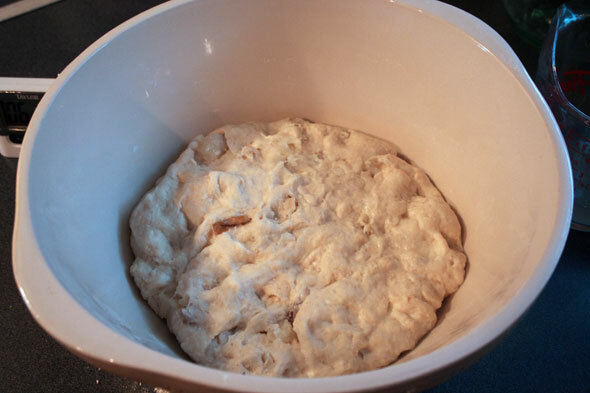 Once mixed, the dough ball is placed into an oiled bowl and allowed to proof for 90 minutes or until doubled. At about the 75 minute mark I checked the dough and noted that it had actually popped the lid and got more than double sized. Glad to see the new jar of instant yeast is working! The dough is again turned out and split in (eyeballed) two equal pieces. Each piece is lightly stretched out to make a 6″ X 8″ rectangle. 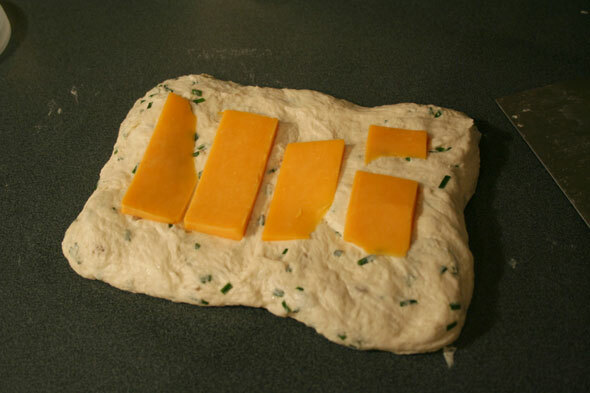 The recipe says to place the cheese slices onto the rectangle then roll it up to form the torpedoes. 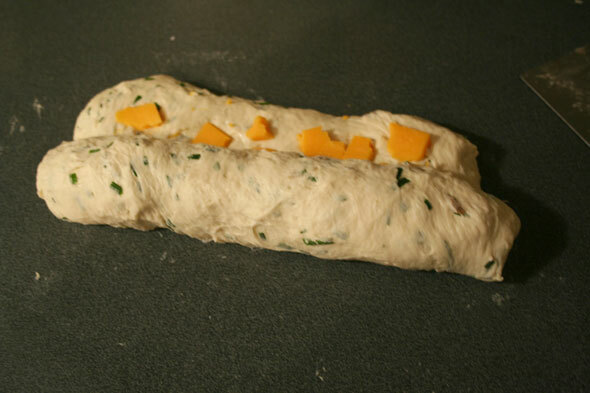 I started to do so but found the cheese chunks too big – they were breaking through the dough. So I decided to break them up into smaller bits. This made the rolling up a lot easier with no cheese trying to escape. 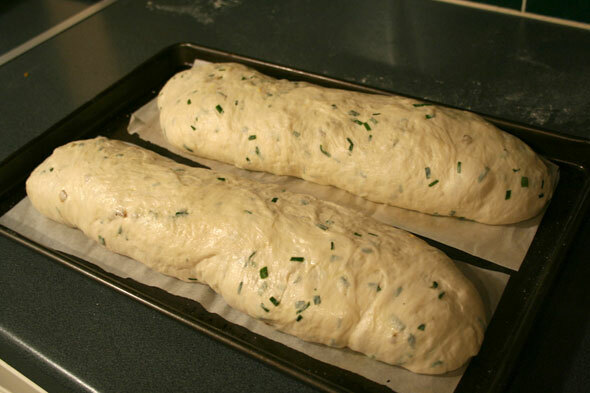 The two loaves were then formed – I don’t think I got the “torpedo” shape done very well, the dough was still very soft and tacky – they were placed on parchment (forgot to sprinkle it with cornmeal) got covered and were ready to do the final proof for about 1 hour. The “hearth oven” setup was preheated to 500ºF while the loaves proofed. After the hour was up the loaves were “nearly doubled in size” but seemed a bit on the flat side. I hoped they’d get good oven spring. I slashed them deeply, trying to find the cheese layer inside, as per instructions. This added to the flatness issue. They didn’t totally deflate but certainly did seem to widen out. The loaves now go into the 500º oven, I decided to leave them on the parchment in the pan but they still went onto the oven stone. Tossed a cup of water into the heated fry pan in the oven and sprayed the oven walls, as per instructions, every 30 seconds for 3 turns, then turned the heat down to 450ºf. The loaves stayed in for 35 minutes with a spin at the halfway mark. Once bakes they were left to cool for 45 minutes. The loaves had pretty decent oven spring, although they remained rather wide. But then I look at the photo in the BBA and that bread seems to be a rather low and wide bread too, so perhaps this isn’t unexpected. The slashes allowed some of the cheese to bubble and drip which does look quite yummy. And after the cooling off period, I was able to finally get a couple of slices out to check the crumb. And, since I had it sliced, I thought I’d have a taste too. This is really good bread. The crumb texture, visually, is even with smallish holes. I expect that’s the potatoes in action. The spotting of potato skins adds some visual interest, there’s the cheese pockets here and there and the spots of green chives throughout. Visually, very appealing. 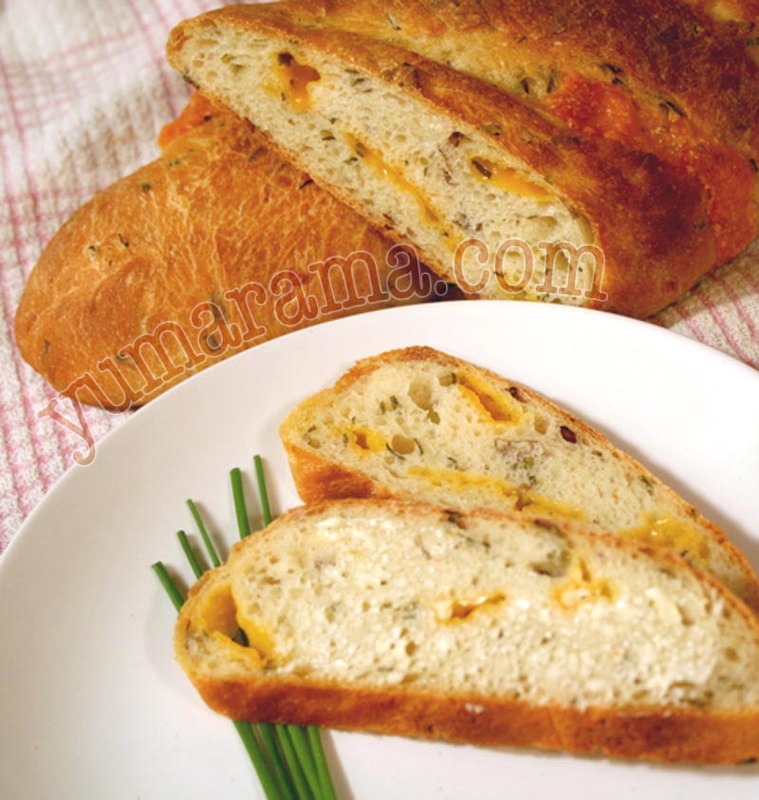 The crumb is a little tighter that I’d have expected but still soft, the flavour of the chives is prominent without being overwhelming, the cheese adds a bit of pleasant surprise here and there. The crust, right after cooling, is light and thin, not too hard but still crispy with a little bit of chew. We’ll see what happens after storing it overnight. All in all, this is decidedly a major step up from the last bread and a good sign we’ll be ending the Challenge on positive notes. Although this is really a ‘specialty’ bread not specifically suited for all occasions, it may not be the best match for jam toast in the morning, it can still be a great bread to pull off for family dinners, I’d expect it would stand up nicely to heartier meals like stews or roast beef. It’s not a shy bread and makes for a delicious slice all on it’s own too. This one goes on the “Do It Again” list for sure. SallyBR at Bewitching Kitchen says it’s one of her favourites. Anne Marie at Rosemary & Garlic did hers partly by proxy and they came out lovely. The final bread in the book, Roasted Onion and Asiago Miche, sounds like a lovely bread to close the challenge with. It is, again, a sourdough/instant yeast hybrid. Unlike today’s bread, it is a three day affair (mostly just waiting for stuff to ferment overnight) which I’m rather looking forward to. It also has a pound of cheese in it. How can that possibly be bad? I love the yellow bits of cheese. .-= Oggi´s last blog ..Bringhe =-. Gorgeous! I am coming over to steal one and I am going to eat it plain with a bottle of wine. Yay for having one left! I posted the white bread today – I had made it into hamburger buns – now I am glad since you said it was sort of boring on its own. 10 left for me now, so excited. I am hopscotching around now, doing the ones that we need at the time. And am secretly thrilled (ok, not so secretly) when the post-it note is removed from each completed bread page. .-= Natashya´s last blog ..Vegetarian Chili with Cornbread Topping =-. My starter is not waking up quickly, I had hoped to make this today. Great post, love the details. .-= Anne Marie´s last blog ..Mezze, The Daring Cooks Challenge =-. 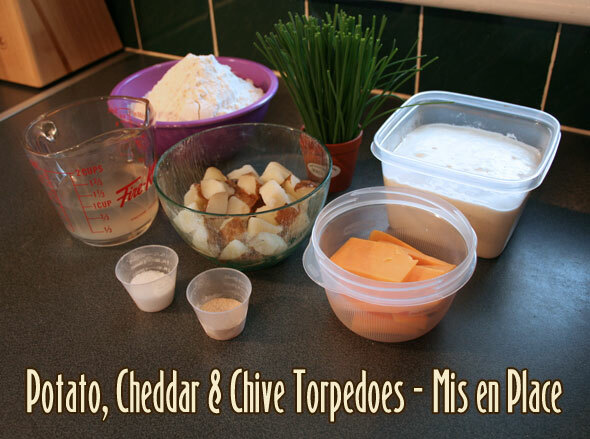 Cheddar cheese, potatoes and chives… what’s not to like? Your loaf looks picture perfect. The step by step photos are wonderful as usual. I think we have all improved our photography skills in this challenge, along with our baking skills! Only one left for you!! Wow, what’s next? .-= Cindy´s last blog ..100% Sourdough Rye =-. Great job, as always. 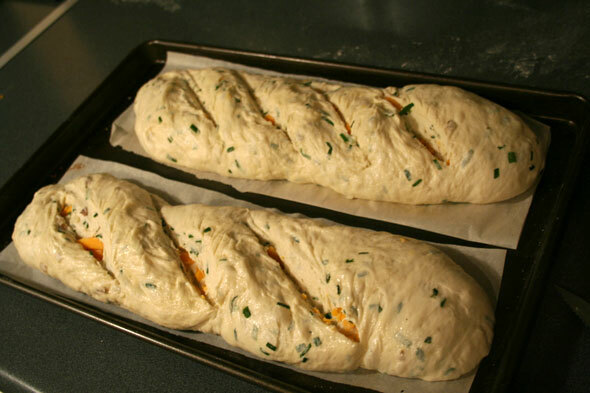 I can’t wait to make this bread. I fed up my starter last night but didin’t make it to the store for potatoes, chives and cheddar, so I settled for making basic sourdough this weekend. .-= Phyl´s last blog ..BBA Whole Wheat Bread — In a Word, Meh =-. 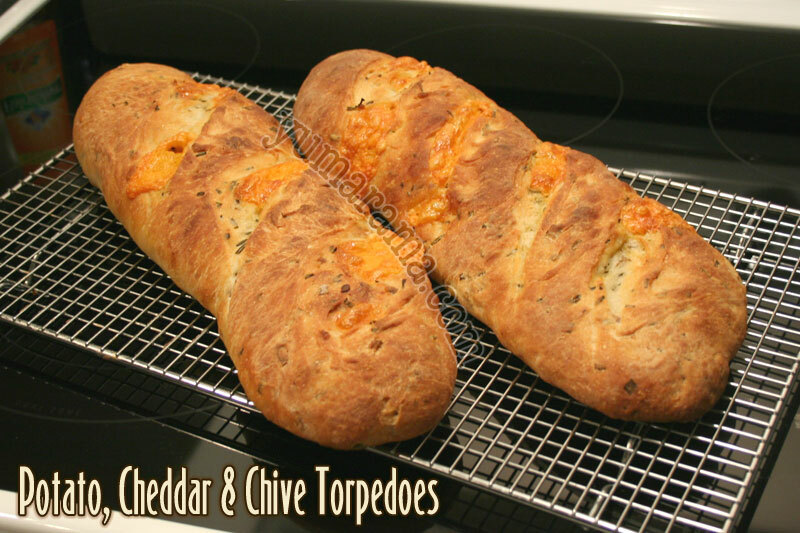 This looks great — I don’t think I could resist the cheese poking its way out of the cuts. Delicious! .-= Susan/Wild Yeast’s latest blog post: Little Feet Biscuits =-. I bet this bread would taste good as the outsides of a roasted veggie sandwich. It looks absolutely delicious! .-= Mimi’s latest blog post: Left over brown rice becomes amazing dinner rolls =-. This bread looks so delicious! It looks like the perfect companion to a nice hearty stew, although I’d love to just spread some butter on it! I’ll have to give this one a try. .-= Jeanne’s latest blog post: 2010 LA Cupcake Challenge =-. The potato, cheddar and chive combination is truly a match made in heaven. I bet this bread actually would taste pretty good with some raspberry jam on it! (Sort of Monte Cristo-esque?) 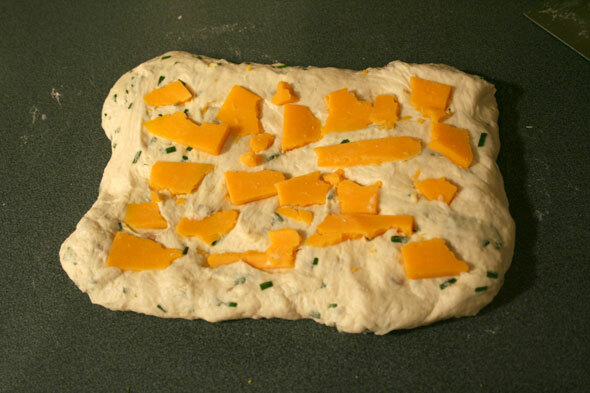 I love the cheddar streaked through it. 1) How much starter is required? 2) Does the starter need to be proofed? 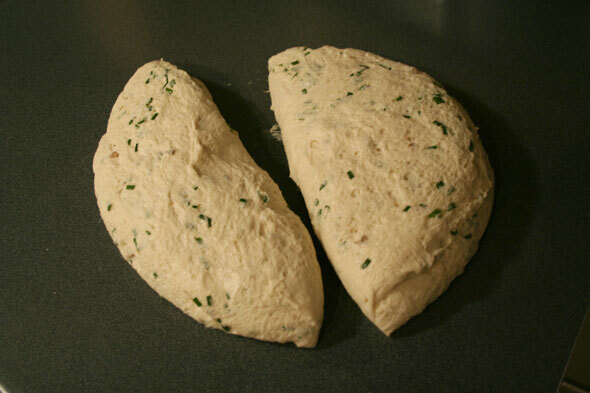 The recipe in the BBA asks for 297 grams – we can call it 300 – of starter. I’m not really certain what you mean by proofing the starter. If you’re asking if the starter should be refreshed and active before using, then yes. 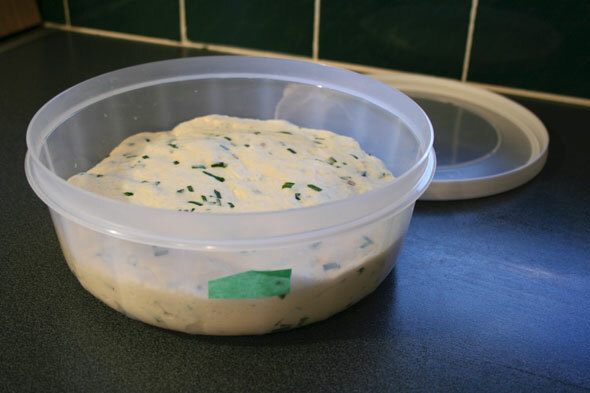 You always want to use your starter in any bread when it’s just been fed and is at it’s peak. 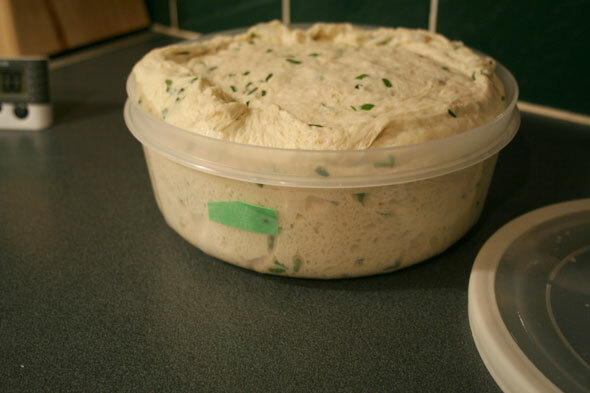 This can be achieved by taking a starter you keep in the refrigerator out the day before (or more if it’s been forgotten for several weeks), and giving it one or two feeds before use. Building from just a small amount of ‘discard’ from a feed to 300 grams can be done in just a couple of steps. I keep my mother starter at 50 grams, using 10 grams to refresh which gives me 40 “excess” to play with. I would feed my original 10 grams separately, keeping it well out of the baking cycle and use the excess I pulled out to build any quantity needed for a recipe. This nearly guarantees I’d never accidentally use up all my starter in making bread, something that has happened to many seasoned bakers – I’ve had one close call myself. To get that 300 grams of starter needed for this reicpe, I could simply build that original ‘excess’ 40 grams to 150 total by adding just 55g each water and flour on the first feed. Once this has maxed up, I would add 75g each water and flour on the second feed; I am now at the required 300g total. As soon as this second feed starter reaches it’s peak, just before it begins to fall in on itself, it is ready to use.